Could it be possible to run your business without paying federaland state income tax for at least 36 months? What if you're not inbusiness-how about reducing or completely wiping out your incometax? It may sound too good to be true, but the answer is YES. 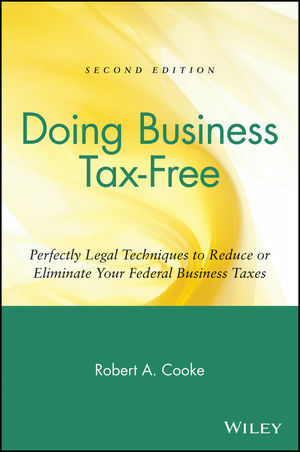 Inthis easy-to-use, plain-English book, Robert A. Cooke shows how youcan legally use the tax rules to your advantage. Doing BusinessTax-Free, Second Edition is packed with tax-saving concepts andideas and clear explanations on how to apply them to your ownsituation. Numerous examples help you understand crucial tax-planningmaneuvers and form a game plan, which, with a little professionalfine-tuning, will alleviate your income tax burden. Plus, you'llsave even more money by learning how to keep professional fees to aminimum and shorten your time in the tax preparer's office. ROBERT A. COOKE, CPA, has had twenty years of experience in public accounting. He has taught numerous seminars on finance and accounting for Prior Resources, Inc., and is the author of several successful books, including How to Start Your Own Subchapter 'S' Corporation and the first edition of Doing Business Tax-Free, both from Wiley. Organize Your Business for the Smallest Tax Bite. Jump into Business and Keep the IRS from Becoming a GreedyPartner. Keep Two or More Sets of Books (Legally) and Other AccountingTricks. Change Personal Expenses into Business Tax Deductions. Taking Money Out of Your Business. Spread the Tax Burden Around the Family. Pay Taxes Late, Years Late, Without Penalty or Interest. Don't Ignore the Alternative Minimum Tax (AMT). Select and Use Professional Help. Appendix A: Tax Rate Schedules for 2000. Appendix B: Often Misunderstood Tax Concepts. Appendix C-1: IRS Ruling on Deducting the Expense ofInvestigating a Business. Appendix C-2: Definition of Research and ExperimentalExpenditures. Appendix C-3: Deductibility of Computer Software Research. Appendix C-5: Business or Hobby? Appendix C-6: Some IRS Rules on Business Entertainment. Appendix C-7: Low Tax on Multiple Corporations. Appendix D: Federal Tax Forms.